Well, hubby and I have been able to enjoy about two dates per month for the past two months. It's been wonderful. The other night, we explored a new restaurant (new to us). It's a hip Chinese restaurant, and it's quite the happening place late at night (so I have been told). Hubby and I went quite early, so we didn't really get to see the "in crowd." But we had a very pleasant early dinner. 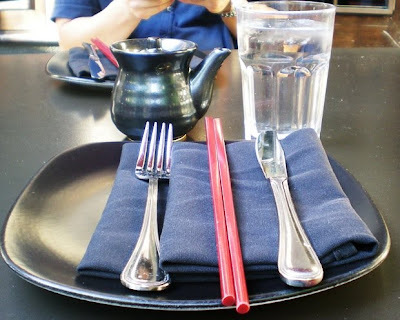 I loved the simple, modern place settings. I got to sit on the cushioned bench; It was very comfortable. 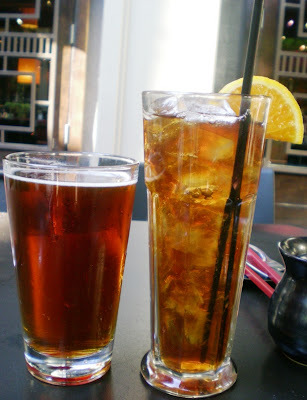 Hubby got a beer, and I got the unsweetened Passion Fruit Iced Tea. It was soooo good! 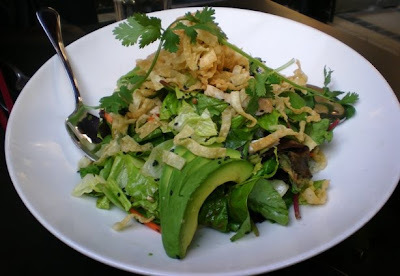 As an appetizer, we shared the Chinese Chicken Salad with Asian Pear, Avocado, & Peanut Hoisin Dressing. It was light and very tasty. 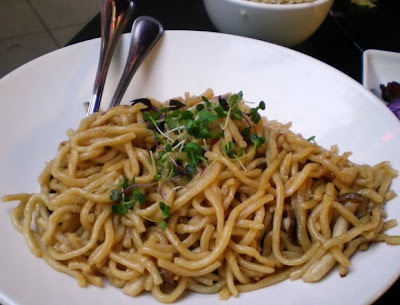 We also ordered the Wild Mushroom Garlic Noodles. The mushrooms were tiny, so you can't really see them in the picture. The dish was very good. Question: Do you find that how much you order in a restaurant has changed over the years? The eggplants look so delicious. Wow, that's some PURPLE eggplant!! And, I love love love hoisin dressing, I think the flavor is so good. When Nick and I go to a restaurant we usually order completely different things. He eats healthy at home, but picks out at restaurants (which is why I don't like eating out a whole lot!!). I really hope as years go by he slowly starts to order less. His eyes are always bigger than his stomach. First of all, I agree that the place settings and the overall appearance of the restaurant are so simple but elegant! And the pictured dishes are just gorgeous. 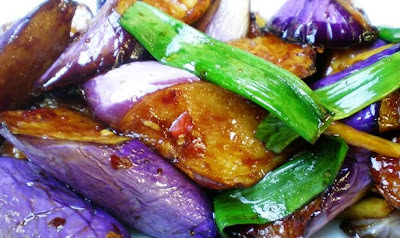 I love the color in the eggplant dish. My husband and I have definitely changed the amount we order and also the items over the past few years. 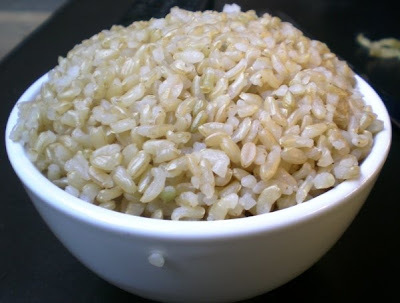 We lean more toward the appetizer, soup, and salad portion of the menu for variety and smaller servings. We also share a lot of items. I hate leaving with that stuffed feeling. I want to enjoy a meal and not regret it. 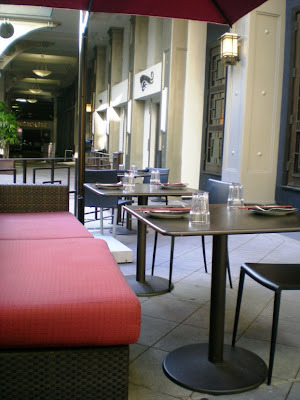 I would love to know the name of the restaurant and what city it is in if you don't mind sharing. Such a nice night out. Everything looks delicious! I find that I will order less now and not feel badly about it. I used to feel embarassed if I only ordered an appetizer or something small because I thought the waitress would be annoyed that the bill wouldn't be worth enough. Now, I don't feel badly about ordering small and I make sure to give a little more tip for the time that I spend there. I love Asian food, and that all looks absolutely delicious! My hubby and I have been making more of an effort the past year or so to also share dishes and not over order. And I love splitting food with him, it makes date night more fun! Looks like a great meal! Yes, now that I'm married and my husband and I go out together and I'm not shy to take more than one bite off his plate we typically find that it works best if we split a few plates together - our favorite combo - appetizer, entree, dessert - it's amazing how if doesn't seem like a lot sometimes but it always fills us up! I find myself disappointed when I don't get a huge portion at restaurants. Obviously I don't need those big portions. I shouldn't be expecting them either. I really just try to avoid dining out all together. yup i find that now i always make sure i have some kind of veggie dish, preferably green! The meal looks great. I'm tempted by that eggplant dish. I have been wanting to try that place for ages! And now I really want to go - the salad and eggplant look divine!!! love date nights! i had one this friday, except my meal wasnt as healthy as yours, lol. that eggplant is an AMAZING color! yay for nights out with the hubby! i think more than anything, i just pay ALOT more attention to ingredients and think through my choices a bit more. i don't go out to eat as much as i used to, so i am okay splurging but its gotta be something GOOD!